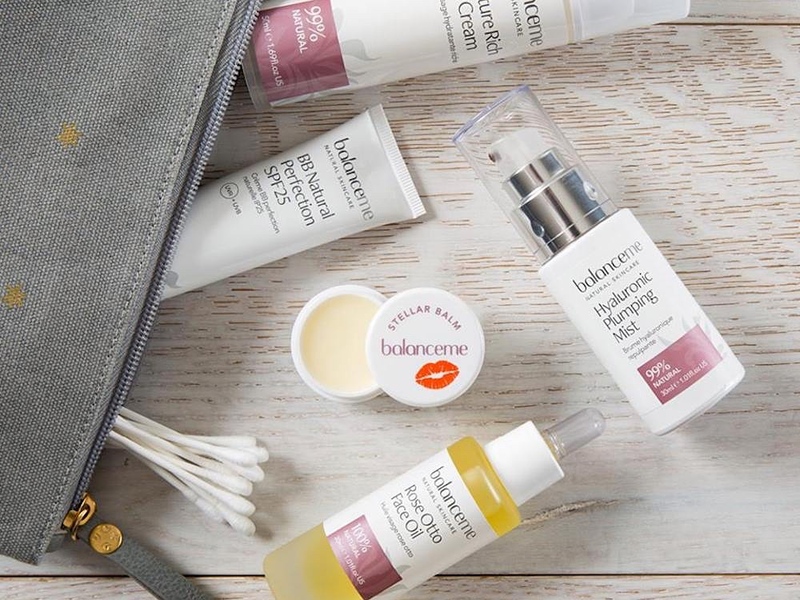 Multi-award-winning skincare brand Balance Me has built its reputation on totally natural products backed by serious scientific credibility. 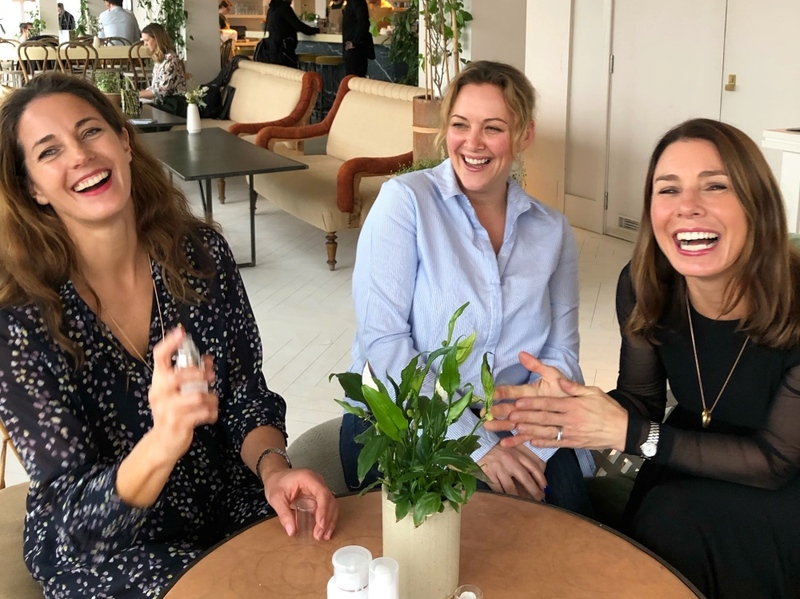 I caught up with inspirational founders, sisters Clare and Rebecca, to find out more - oh, and wrestle away a whopping £1200 worth of Balance Me beauty bundles for you lot! Pass my halo, I’ve been having epiphanies right left and centre recently! I’ve boycotted palm oil for good (goodbye Maltesers, nice knowing you); become a supermarket anti-plastic ninja; and – now that my skin is very much entering its crinkly phrase – I’m finally taking serious notice of what I’m using on it after years of not even giving beauty regimes a thought. 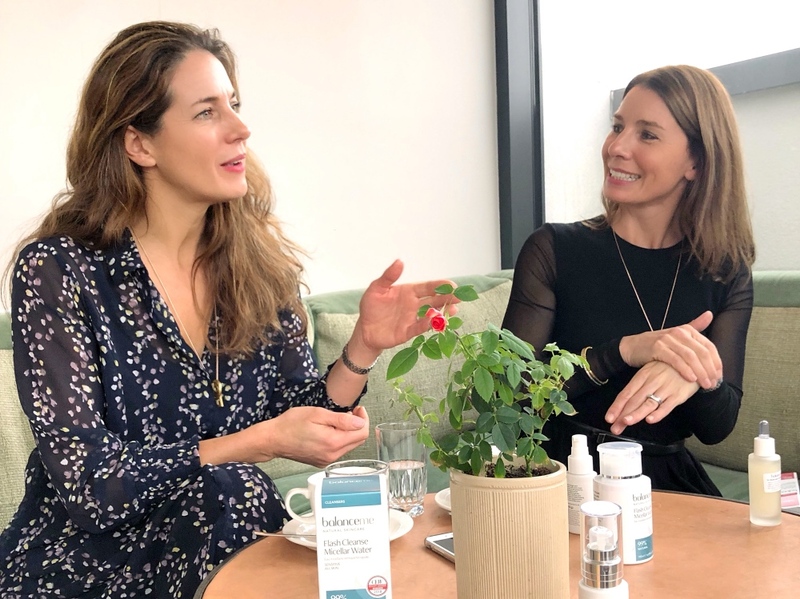 It was Kerry in the Muddy office a few months back who put me on to Balance Me, a British natural skincare brand that’s been taking the beauty world by storm (7 new awards just this year, including a Harper’s ‘Best of the Best’ and Beauty Bible accolades). The brand looks beautiful – bright, white and feminine with a splash of ‘science’ to the design. 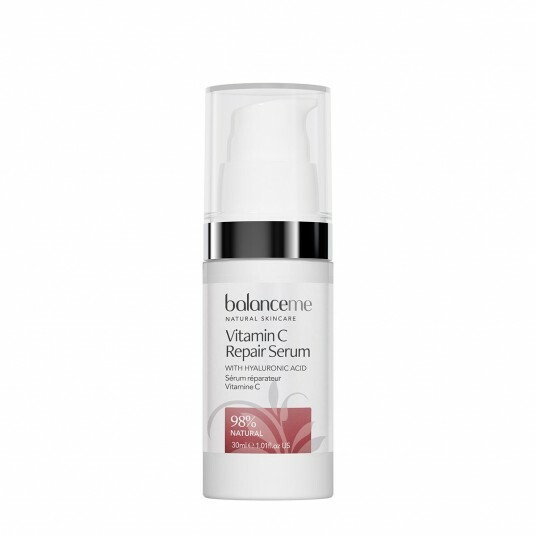 It’s surprisingly affordable too, available in Waitrose, Ocado and Sainsbury’s as well as John Lewis and more boutiquey outlets like Wholefoods, but most importantly, the insider feedback in the industry is this is a brand that really works – no wonder the Vitamin C Repair Serum sold out last year. 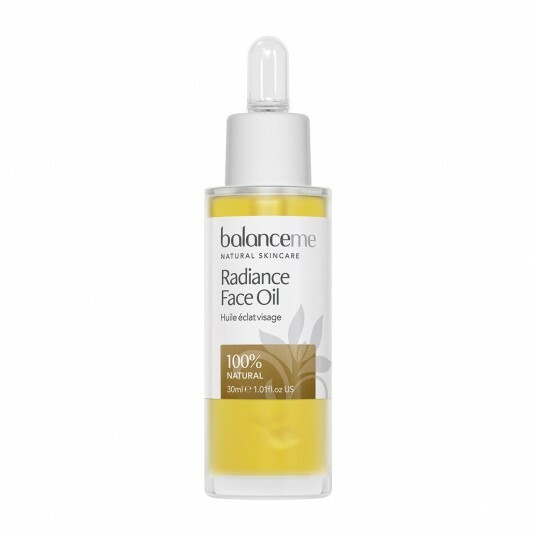 So you’ll be pleased to know we have £1200 worth of Balance Me products to give away in our brand new Reader Treat! 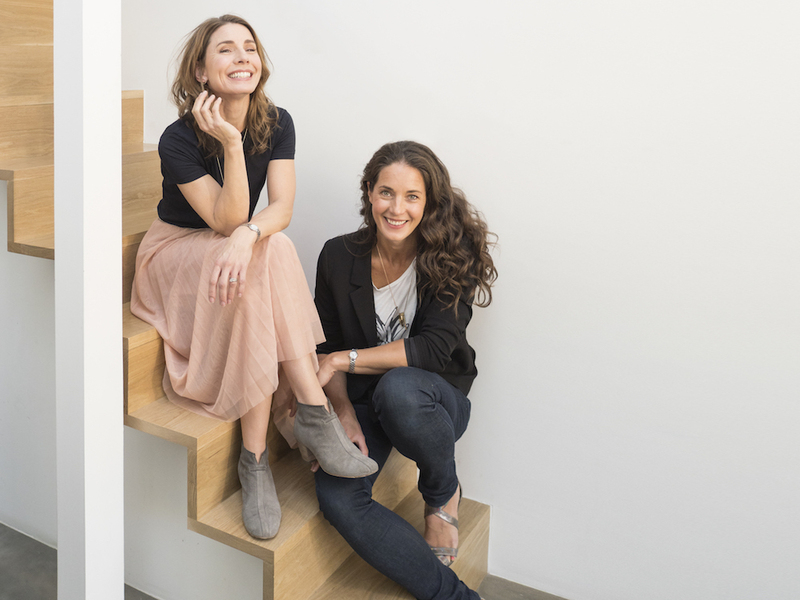 Balance Me’s founders, sisters Clare and Rebecca Hopkins, have taken their kitchen table business to national success in the famously cut-throat beauty game, whilst having kids and dealing with the tricky business of life. I caught up with the dynamic duo last week – here we are, above, wired with coffee at the groovy garden rooms at Bourne and Hollingsworth (near Leicester Sq – recommend it, very funky with great views). Anyway, let me know what you think of the interview – prepare to be seriously inspired – and good luck winning their amazing products! Where did the idea come from for Balance Me? Rebecca: I was working for L’Oreal and Clare was a management consultant but both of us were struggling with work/life balance, and felt that our careers were out of sync with what we really wanted. I’d become interested in reflexology and had trained in it as a hobby while at L’Oreal and Clare had left her job to travel and learn yoga all around the world. Our stars aligned when she returned and our first company was called Balance Being, putting on corporate wellbeing events for stressed out execs. The same kind of execs we used to be! After a while we realised people wanted to take away something with them from these events, so we started making small batches of natural products to give away. I guess our reputation grew from there. When TopShop asked for 200 of our foot polishes for their VIP bags it gave us the confidence to find a manufacturer and, in the end, it was TopShop that took our first Balance Me capsule collection. How hard was it to be a credible natural beauty brand in the early days? Rebecca: Back in 2005 natural beauty was seen as gloopy and unsophisticated, maybe a bit smelly! Stuff you had to keep in the fridge. From the beginning we want challenge that notion – we’ve always been about interesting, innovative ingredients and amazing textures, and also about being completely honest – no sulphates, no parabens. Clare: Serums are the thing now – the super ingredients are natural hyaluronic acid and Vitamin C. We have an amazing complex that has the same effects as a natural botox, it’s all about minimising those mini facial muscle contractions. So we believe in natural but also deliver a solution. Lots of people doggedly ‘keep going’ rather than changing the course of their lives. Why were you different? Clare: When we were in our teens our father had a breakdown. Seeing him go through that and come out the other side as this most positive, energetic person showed us how you can so easily tip if you’re too miserable for too long or hold things inside. Rebecca: My tipping point was when I’d been up all night merchandising shelves in Harvey Nichols for a big beauty launch. I came home at 4am so exhausted, and Clare came in and rubbed my feet! It was a really lovely sisterly thing to do because my feet hurt so much I couldn’t stand up – the whole ‘touch’ thing resonated with me and I just realised wellbeing was key and it was totally lacking in my life. What’s it like working with your sister? Clare: The best thing is that we can be really honest and because we’ve been brought up together we also share the same values – it’s a bit like a marriage in that sense. People assume it might be difficult but we find it the opposite. Have you had any tough times at Balance Me? Clare: When you start growing it can be difficult – suddenly you have an office, you’re employing a team, your time is taking up in ways you never imagined. Working out how to run a business is a big thing to learn. Clare: We had to drive down to get all our stock before the liquidator took everything – were about to launch in John Lewis at the time! We picked it all up, put it in the back of Rebecca’s car and our mum came to London to help hand label things. We could have lost everything. Rebecca: Sometimes employing the wrong people but we’ve learnt that this happens to all our fellow entrepreneurs! Clare: I don’t think you ever know someone’s ‘right’ until they’re in your business, but we’ve really tried to learn from that. One of the big things is we have joined a Chief Exec group where they give you advice – when you join you realise every business has the same problems. As a small business, a couple of wrong people can throw you but it’s about getting the culture right. Rebecca: Some good advice I was given by a fellow female entrepreneur in beauty on hiring staff was to test whether you could go on a train journey for two hours with that person and enjoy it. It actually works! What advice would you give someone thinking of starting their own business? Clare: Cash is king. Make sure your idea can make money. If that’s not possible, it’s not a failure to keep it as a very enjoyable hobby. Rebecca: Also a mentor is really helpful, even if it’s informal – just different people you meet and trust for advice. It’s also worth really thinking through your offering. What’s your office like – I’m imagining gorgeousness. Rebecca: It’s open plan, it’s in Borough, close to the Tate Modern – it has lovely big windows and it’s an attic-type apartment with wooden floors. Tom Daley lives in the same block apparently though we’ve not seen him! We love our office, but I won’t lie, it’s small! Clare: My partner is a designer and has designed the space incredibly efficiently with lots of hidden storage space. We couldn’t work every day in a pre-fab, grey building and we love the location, but to have more space in this area would be astronomical, so we’ve been sensible. Clare: As my children are getting older – they’re now 6 and 8 – I’m finding it’s really liberating in terms of personal time. We both take lots of holidays with family, we treat ourselves that way. I’m getting to swim more – I used to swim a lot as a child and I plough up and down a lovely heated lido near me. I do yoga and I’ve also been having tennis lessons with a neighbour for over a year now. I try to maintain a balance between family time, business time and me time – it’s liberating to learn to say no. Rebecca: Clare inspired me to get into yoga and I love it, and I also run, play tennis and do things with the children. We’ve set ourselves a family challenge for 2019 – a year ago my 12 year old daughter had open heart surgery, so we want to give something back to Great Ormond Street hospital and have decided to cycle to Paris. Thinking about it, I’d better start training for that! This elixir is amazing – it works very hard with a low weight molecular hyaluronic acid (basically a plumping agent, has a lovely fragrance, and is calming on the skin (so great for problem skins). Also a winner in the CEW Beauty Awards, and the Red Magazine Beauty Awards for Best On-The-Go product. The one thing beauty editors tell you to do above everything else is cleanse. 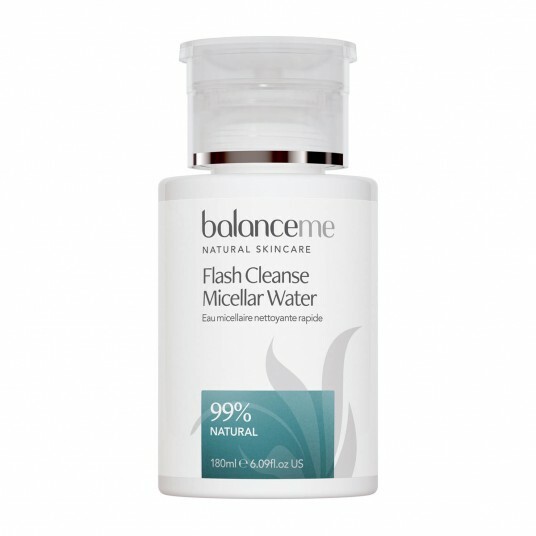 This is the latest cleanser in our range and we love it. It doesn't need water to froth or rinse off, just a bit of cotton - we’re trying encourage people to bin wet wipes. It will take off your make up really easily too. It was a winner in the 2018 CEW Beauty Awards category Best New Everyday Facial Skincare Product. 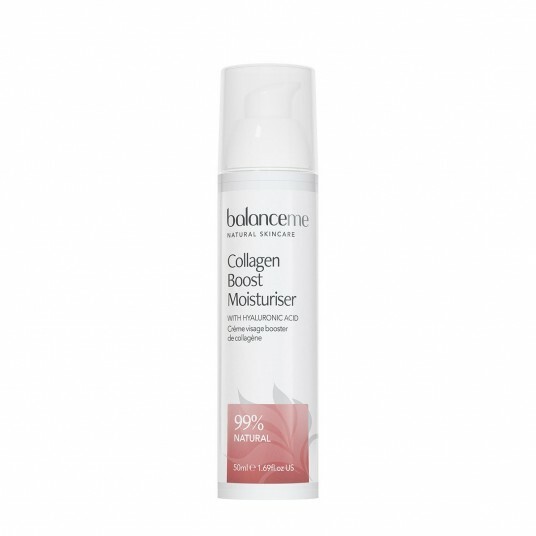 This moisturiser uses natural tri-peptide, to help with extra elasticity and collagen production. It mimics broken down collagen to trick your cells into producing more, but at the same time it works to inhibit the enzyme that breaks collagen down in the first place. It’s very hard working and accessibly priced at £26. Ideal for 35+ skin though everyone would benefit. We love this product as it’s instant dewiness in a bottle! It’s incredibly versatile – a great overnight treatment to strengthen the skin and light enough in the day to layer over moisturiser or a couple of drops with foundation for a light bright appearance. We can’t keep this in stock! Vitamin C has been around for years, but we’ve found this very stable version of the ingredient from Japan, and we’ve linked it with a very interesting ingredient Melavoid. Our customers’ biggest concern is visible lines but a close second is pigmentation, and this serum addresses both. It’s hydrating, great for elasticity and also addresses skin tone. Holy spritzers! 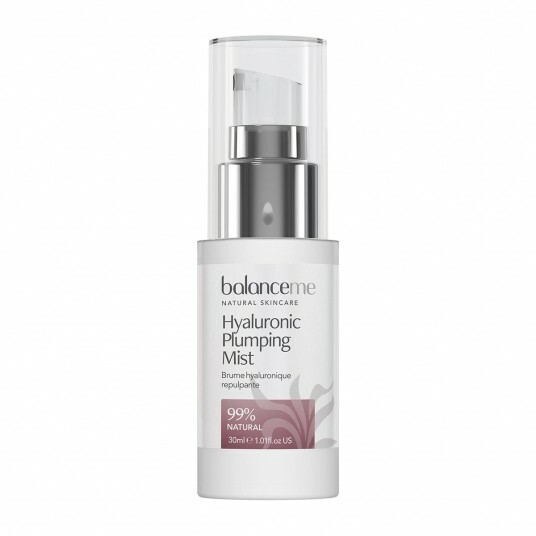 We have 10 bundles of these 5 gorgeous Balance Me products, each worth £120, to give away in our Reader Treats. Enter here for gorgeous skin incoming!